In Harvard's Pierce Hall, the surface of a small germanium-coated gold sheet shines vividly in crimson. A centimeter to the right, where the same metallic coating is literally only about 20 atoms thicker, the surface is a dark blue, almost black. 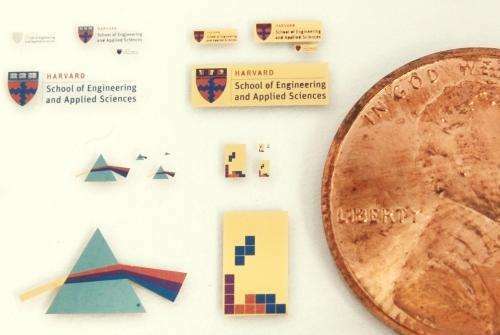 The colors form the logo of the Harvard School of Engineering and Applied Sciences (SEAS), where researchers have demonstrated a new way to customize the color of metal surfaces by exploiting a completely overlooked optical phenomenon. For centuries it was thought that thin-film interference effects, such as those that cause oily pavements to reflect a rainbow of swirling colors, could not occur in opaque materials. 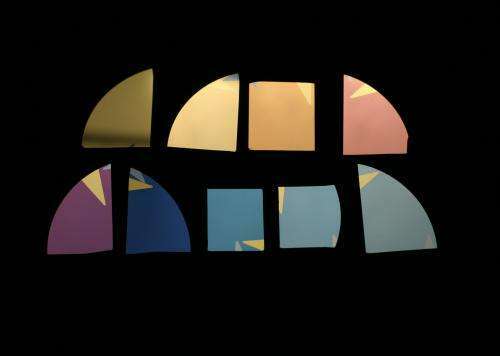 Harvard physicists have now discovered that even very "lossy" thin films, if atomically thin, can be tailored to reflect a particular range of dramatic and vivid colors. 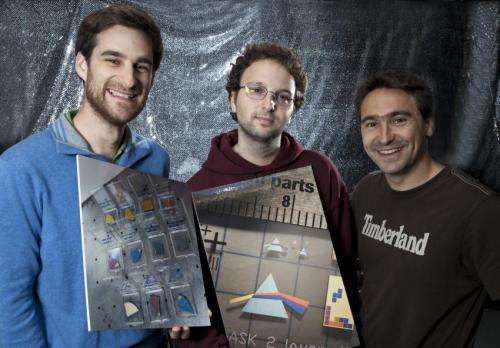 Published in the journal Nature Materials on October 14, the finding opens up new possibilities for sophisticated optical devices, as well as consumer products such as jewelry and new techniques in the visual arts. The discovery is the latest to emerge from the laboratory of Federico Capasso, Robert L. Wallace Professor of Applied Physics and Vinton Hayes Senior Research Fellow in Electrical Engineering at SEAS, whose research group most recently produced ultrathin flat lenses and needle light beams that skim the surface of metals. The common thread in Capasso's recent work is the manipulation of light at the interface of materials that are engineered at the nano- scale, a field referred to as nanophotonics. Graduate student and lead author Mikhail A. Kats carried that theme into the realm of color. "In my group, we frequently reexamine old phenomena, where you think everything's already known," Capasso says. "If you have perceptive eyes, as many of my students do, you can discover exciting things that have been overlooked. In this particular case there was almost a bias among engineers that if you're using interference, the waves have to bounce many times, so the material had better be transparent. What Mikhail's done—and it's admittedly simple to calculate—is to show that if you use a light-absorbing film like germanium, much thinner than the wavelength of light, then you can still see large interference effects." The result is a structure made of only two elements, gold and germanium (or many other possible pairings), that shines in whatever color one chooses. "We are all familiar with the phenomenon that you see when there's a thin film of gasoline on the road on a wet day, and you see all these different colors," explains Capasso. Those colors appear because the crests and troughs in the light waves interfere with each other as they pass through the oil into the water below and reflect back up into the air. Some colors (wavelengths) get a boost in brightness (amplitude), while other colors are lost. That's essentially the same effect that Capasso and Kats are exploiting, with coauthors Romain Blanchard and Patrice Genevet. The absorbing germanium coating traps certain colors of light while flipping the phase of others so that the crests and troughs of the waves line up closely and reflect one pure, vivid color. "Instead of trying to minimize optical losses, we use them as an integral part of the design of thin-film coatings," notes Kats. "In our design, reflection and absorption cooperate to give the maximum effect." Most astonishingly, though, a difference of only a few atoms' thickness across the coating is sufficient to produce the dramatic color shifts. The germanium film is applied through standard manufacturing techniques—lithography and physical vapor deposition, which the researchers compare to stenciling and spray-painting—so with only a minimal amount of material (a thickness between 5 and 20 nanometers), elaborate colored designs can easily be patterned onto any surface, large or small. "Just by changing the thickness of that film by about 15 atoms, you can change the color," says Capasso. "It's remarkable." The researchers have already performed the same treatment on silver, making it appear gold, as well as a range of pastel colors. Harvard's Office of Technology Development has filed a patent application and is working with the Capasso lab to pursue the commercialization of this new technology, either through a start-up company or through licensing to existing companies. Application areas being explored include consumer products and optical devices, such as filters, displays, photovoltaics, detectors, and modulators. I was told years ago that the iridescent coloring seen on the clean smooth surface of aluminum is an atomically thin layer of aluminum oxide. However aluminum oxide in bulk is a white opaque powder. How is the iridescence of aluminum oxide different than what is being demonstrated in this research?